1st Row: Randy Stewart, Carolyn McCaughern, Gary Horton, George Robinson, Gary Gedrose, Jimmy Shaefer [Shafer ? ], Charles Raimer. 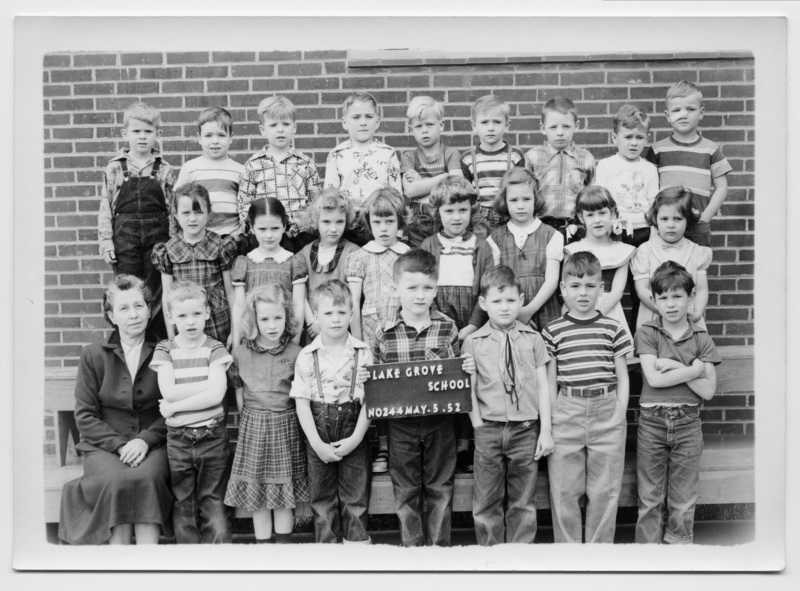 2nd Row: Noel Gabie, Judy Rees, Becky Bean, Diana Hale, Nancy Vincent, [remaining names missing.] 129 Schools, Lake Grove, class photo. Mrs. Hargreaves. Dupe of 128. Description Scanned as B & W, same as 402a. Clara Hargreaves is the teacher. Sign held by student: Lake Grove School No. 244. May. 5.52. Transcription 1st Row: Randy Stewart, Carolyn McCaughern, Gary Horton, George Robinson, Gary Gedrose, Jimmy Shaefer [Shafer ? ], Charles Raimer. 2nd Row: Noel Gabie, Judy Rees, Becky Bean, Diana Hale, Nancy Vincent, [remaining names missing.] 129 Schools, Lake Grove, class photo. Mrs. Hargreaves. Dupe of 128.